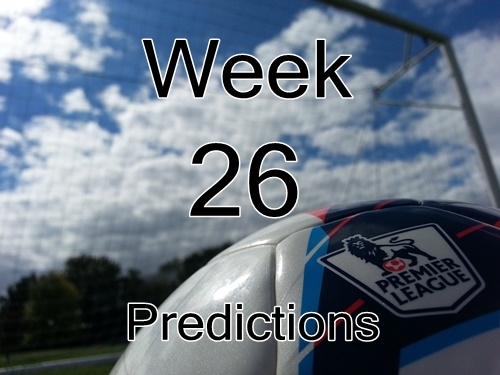 Week 26 in Premier League predictions returns following a weekend of FA Cup matches. My EPL picks include each of the ten matches. Once again there are some pretty important matches this weekend that will help determine positions in the table, especially in the top four and bottom three. Aston Villa face off against Stoke and hope to continue their run of scoring as well as build on their FA Cup win. Meanwhile, Stoke will be hoping that dropping out of the FA Cup will refocus their attention on the Premier League. I am predicting a scoring draw in this one but give Villa the edge, just barely. Chelsea should see off Burnley without much problem and keep their lead at the top while I am also picking Manchester City over Newcastle United. Both teams will have benefitted from the extended break without any FA Cup matches. Sunderland have been struggling of late which compares to West Bromwich Albion and their newfound scoring. This could be a very interesting match and one that could also fit into which team will be relegated this season. Hull City and QPR will also play out a classic six pointer and I’m predicting that Hull will come away with all three points despite Queens Park Rangers’ most recent away win. Both Manchester United and Tottenham face difficult matches against Swansea City away and West Ham United at home. I am, however, picking both teams to come through as winners and keep the pressure on those teams around them including Southampton and Arsenal. Arsenal will be hoping that their FA Cup win over the weekend will propel them into another weekend of EPL action. Crystal Palace have had some positive performances lately and will make it interesting. While I am predicting an Arsenal win, it won’t be an easy one and Crystal Palace could definitely nick a win if the Gunners get complacent. Meanwhile, Everton have continued to struggle and face a Leicester City side that have a point to prove after their 2-1 loss to Aston Villa in the FA Cup. This could be the most boring match of the weekend and I wouldn’t rule out a 0-0. At the same time, it could also be the most exciting match of the weekend if both teams decide to really go for it. The weekend’s final match features Southampton hosting Liverpool in what will be a hotly contested match. Liverpool are the in-form team here and are hoping to continue their climb towards a second season of Champions League soccer. Southampton, meanwhile, will have had the last week and a half to prepare after having off from the FA Cup and not having to deal with Europa League obligations. With all of that in mind, I’m giving the Saints the edge and predicting that they come away with all three points to continue their own push for Champions League soccer next season. That wraps up another weekend of Premier League action with all of my picks and predictions. I expect it will be yet another fun two days of EPL soccer. ← Which Premier League Teams Will Get Relegated?